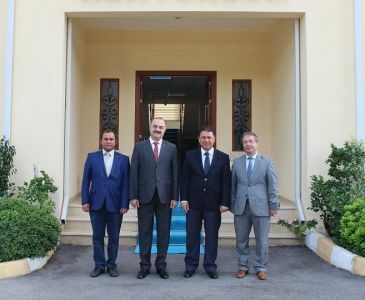 A new cooperation agreement in the field of engineering has been signed between ITU-TRNC Education and Research Campuses and Eastern Mediterranean University (EMU). ITU-TRNC Rector Prof. Dr. Ercan KAHYA and EMU Rector Prof. Dr. Necdet OSAM signed the protocol at EMU’s Rectorate on July 3, 2018. ITU Electric Electronics Faculty Dean Prof. Dr. Serhat ŞEKER and EMU Faculty of Engineering Dean Prof. Dr. Aykut HOCANIN signed the agreement as witnesses. Istanbul Technical University Vice Rector Prof. Dr. İbrahim ÖZKOL, ITU-TRNC Vice Rector Prof. Dr. Serdar KUM, EMU Vice Rector responsible for Student Affairs Prof. Dr. Halit Tanju BESLER, Vice Rector responsible for Administrative and Technical Affairs Prof. Dr. Naciye DORATLI, EMU Faculty of Engineering, Head of Department of Electric and Electronics Engineering Prof. Dr. Hasan DEMİREL were present during the ceremony. ITU-TRNC Rector Prof. Dr. Ercan KAHYA said: ‘I see EMU as my second home. We are like one university of the same city and these relations got stronger with the administration of Prof. Dr. OSAM’ and added that there will be successful works between the two universities. EMU Rector Prof. Dr. Necdet OSAM said that there is a nice rhythm with ITU-TRNC and with the cooperation agreement there will be good works in the fields of engineering. Prof. Dr. OSAM thanked the teams of both universities and wished the best for the protocol. With the signing of the cooperation agreement, a scientific, technological and educational relationship between ITU and EMU is being planned to improve. As part of the agreement, the Cognitive System Laboratory at EMU will have a common coordination with ITU-TRNC. 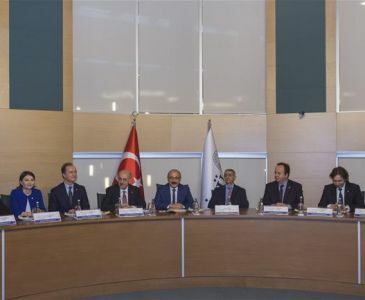 Thus, researchers from ITU-TRNC and EMU will be able to participate in consortiums supported by the industry and government and create various projects within different international fields related to scientific and industrial applications.